We are fast approaching February and the season of love. 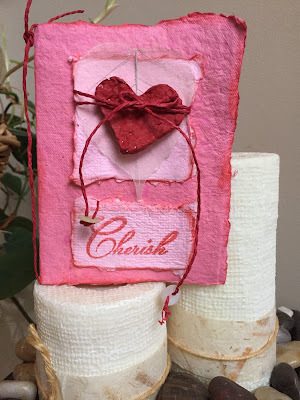 Why not should your love with a card made from hand made paper? to create both a pink and red paper. To create the heart, I made paper pulp which I squeezed through a strainer to remove most of the water. I pressed the pulp into cookie cutters and removed as much water as possible using the sponge and wood block from my Papermaking Kit. These can be dried either in a low over (250 degrees for 15 - 20 minutes) or air dried. Once, dry, I painted the heart red. I stamped the sentiment and inked the edges of the card and the pink papers. I added a Skeleton Leaf and twine to the heart embellishment. Isn't this prettier than a store bought card? I think so. Thank you for visiting today. If you need any paper making supplies please stop by the Arnold Grummer's website. Tis the Season ...... for thank you notes! The gifts have been opened. Maybe even put away or being used. Now is the time to get the pen and paper out to write thank you notes! Instead of just writing them, why not also make them!! Grab that recycle bin including Christmas wrapping paper and a Hand Pourmold! Before you know it, you have pieces of paper for cards! For this card I chose a premade card base. Here is a tip for creating the torn edge look - using a paintbrush, paint a line of water. Once it is soaked through, gently pull apart. I stamped the piece of handmade paper with a metallic paint. I also used a printed deli type paper and nesting dies to created the sentiment medallion. I painted one of the hand made paper layers and around the edges of the smallest medallion. I think it looks so elegant! So much prettier than a store bought one! This is a fun project for those children who are home for the holidays! Head on over to ArnoldGrummer's to find all the supplies you need!